The booming industry that is major college athletics has, for better or worse, changed the way we view the role of a college coach. They’re not really a caretaker or teacher anymore, they’re in town to do one thing: win. And it’s expensive to field a winning program. The top 10 in terms of yearly expenses from 2015-16 (the latest data USA Today has available) is littered with winners: Alabama, Ohio State and Oklahoma to name a few. Win and you keep the money flowing — eight of the top 10 in expenses are also in the top 10 in revenue — but lose and you start making changes. Still, the game’s very best know that you have to do one to accomplish the other. You can feel that when you get those brief glimpses into Nick Saban’s practices, you could see it when Scott Frost and his staff transformed a winless team into an unbeaten one, you can hear it when you find yourself down that rabbit hole on a Sunday watching old YouTube clips of Nebraska in the 80s and 90s and listening to Tom Osborne talk. Osborne hears it at Husker practices now, too. He recently told the Journal-Star that the screaming and hollering you’d find elsewhere has been replaced by teaching. At the end of the day, coaching a bunch of 18, 19 and 20-year-olds has to have some element of that. This staff gets it. Through the first two weeks, that hasn’t just been a talking piece, it’s been reality. Things have been sloppy and offensive line coach Greg Austin wasn’t happy with his group’s Saturday, saying it “was not a good day, I can just be honest with you on that,” but instead of ripping his guys he went a different way. Players have frequently talked about the “shoot your shot” atmosphere that’s developing in practice and how freeing it is to play without fear of making mistakes or fear of getting yanked by a coach if something goes wrong. The install for both sides is mostly done at the midway point of spring, so moving forward it will be about “tightening the screws,” as running backs coach Ryan Held puts it, and in that regard, the staff will look to minimize as many flubs as possible. But, even before the install was complete, coaches haven’t been worried about mishaps as much as repeated errors. That’s an approach that’s shared by pretty much everyone in the coaching unit. 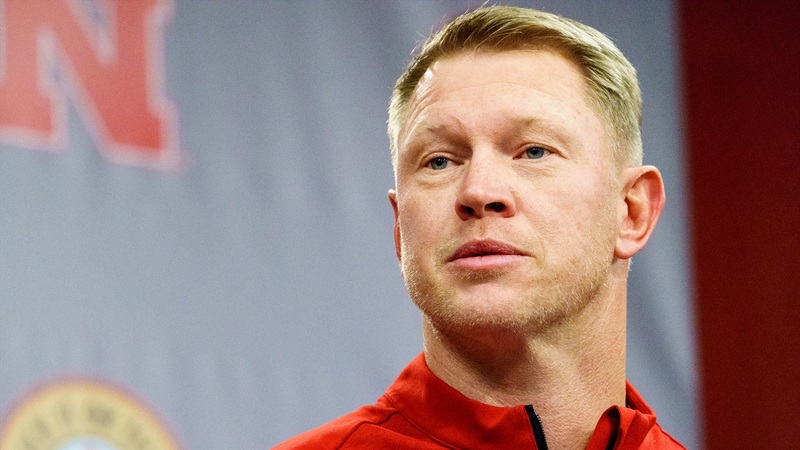 Last week, defensive coordinator Erik Chinander said “I believe what he believes” when talking about Frost’s tackling philosophy, but he really could have been talking about anything. The cohesion of the unit has been on full display since their early days in Lincoln. Film room is as important as anything because of the pace of practice. Guys like cornerback Lamar Jackson and wideout JD Spielman have said they don’t even have time to talk after plays because everything happens so fast, so the major corrections come in the film room when guys can catch their breath. On the field, the staff uses codewords. So, if a running back is supposed to run through a gap and they don’t, Held will yell “run through the smoke.” If a back doesn’t “chomp down” on the ball on a handoff, Held yells “Pacman.” They’ve even borrowed some Adidas terminology. There’s also an interesting thing happening at the end of drives. Even if a ball-carrier gets tackled or falls down, they finish the play in the endzone. Offensive coordinator Troy Walters has been tweeting with the hashtag “Playmak6rs” a lot recently. The six represents points, and the Husker offense — which ranked 84th in scoring and 111th in red zone conversion percentage — wants to live in the end zone this season. There’s still a long ways to go before the results of this offseason course can be put on full display, but there’s plenty of optimism over how this new squad will test out. A benchmark of sorts (remember those in school? Gross.) takes place on April 21, then what could amount to a mid-term on Sept. 1 when Frost and Co. take to Tom Osborne Field for the first time against Akron. The last time this staff took on a rebuild, their approach paid off spectacularly. They’re looking for the same here.